Today with almost 78 % of recruiters having hired someone through social media, and around 94% planning to use social media in their recruitment efforts, it was the right time to bring “The New Normal of Recruiting - Ideas, Strategies and Tactics to Help Your Organization Recruit Fast” to life. Anil Jwalanna is a Silicon Valley technology entrepreneur and product visionary with more than 15 years experience building and managing software as a service and technology platforms. He is passionate about building product companies that cater to business needs using innovative and cutting edge technologies. He has successfully established several start ups and has also held senior positions at Fortune 500 companies. Over the span of his career, Anil has worked with dozens of internal and external recruiters to fill 100's of roles, for both technical and non-technical positions. His active involvement with talent acquisition, executive recruitment, team management and resource management - across both large enterprises and startups --gives him a powerful perspective on social recruiting as a way to compete for top talent. "In today's re-emerging economy, hiring the best is not easy. It takes trust, creativity and persistence. 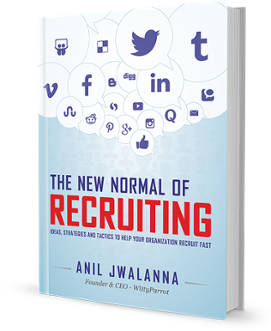 And one simple cannot ignore the power of social media in recruiting" says Anil. Anil holds business degrees from the U.C. Berkeley Haas School of Business and Columbia University's Business School and an undergraduate in Mechanical Engineering.